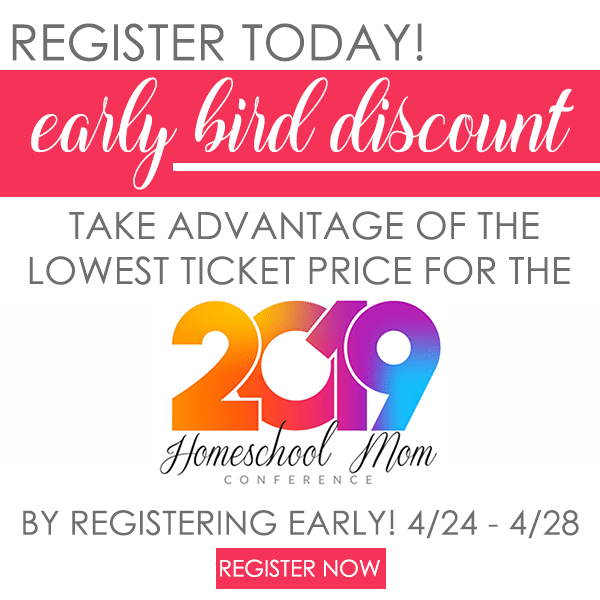 I’m pretty excited to be teaming up with a bunch of other bloggers to help bring God’s Word into the hearts of little ones in a fun and interactive way. From now until the end of March, a new hands-on activity will be added (44 in all) each day to this list. 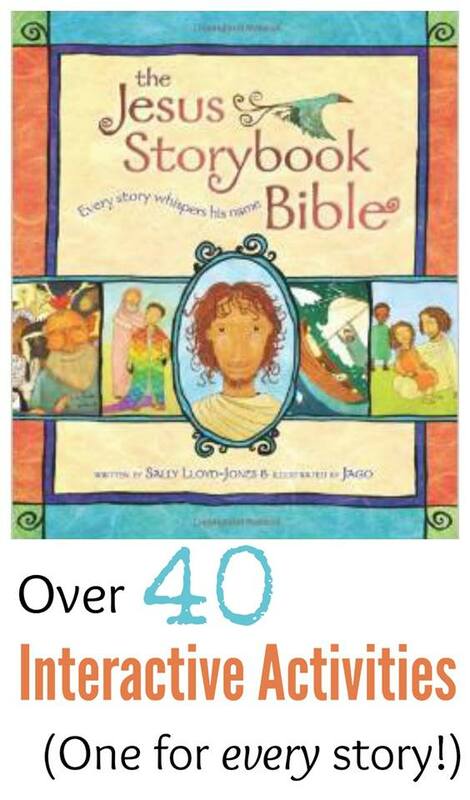 Each activity will correspond to a chapter in the very popular, The Jesus Storybook Bible by Sally Lloyd-Jones. I chose to make up an activity for the second chapter of the book – The beginning: a perfect home. 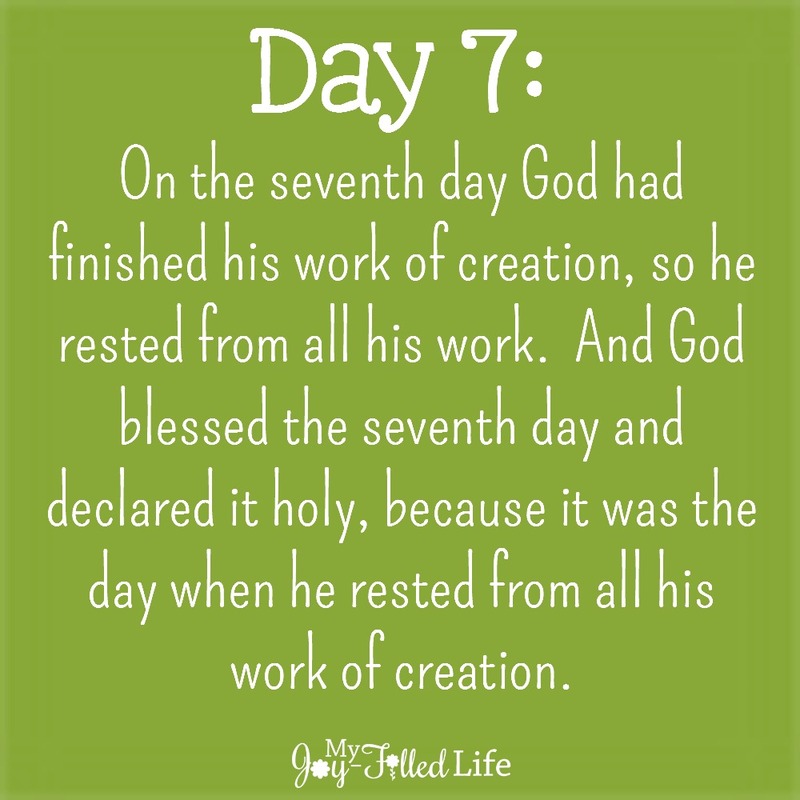 This chapter is a beautiful recount of the 7 days of creation. I chose this chapter because one of my favorite parts of the Bible is the very beginning – the story of creation – when God made everything out of nothing. It’s a beautiful and amazing story and I love reading it with my kids. 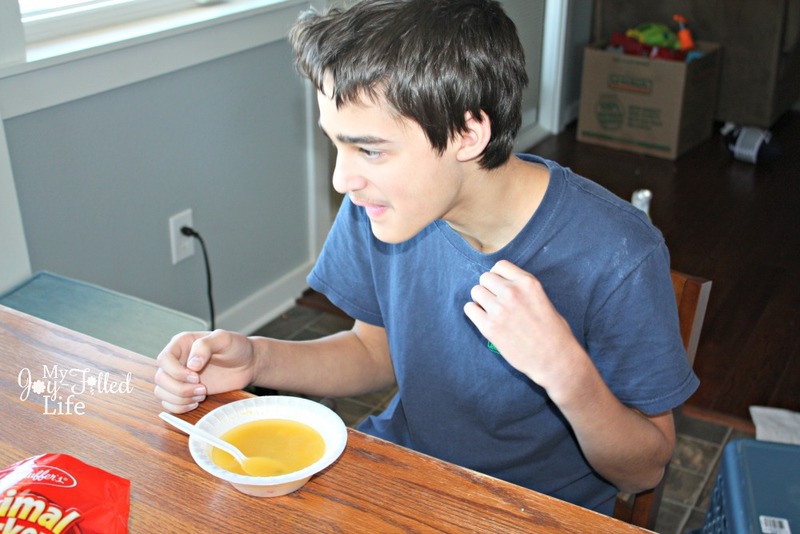 It’s not that hard to get some of the days of creation mixed up, so I wanted to do something with my kids that would make each day of creation more memorable. If they had some kind of hands-on interaction with the days of creation, they will be more likely to remember them. 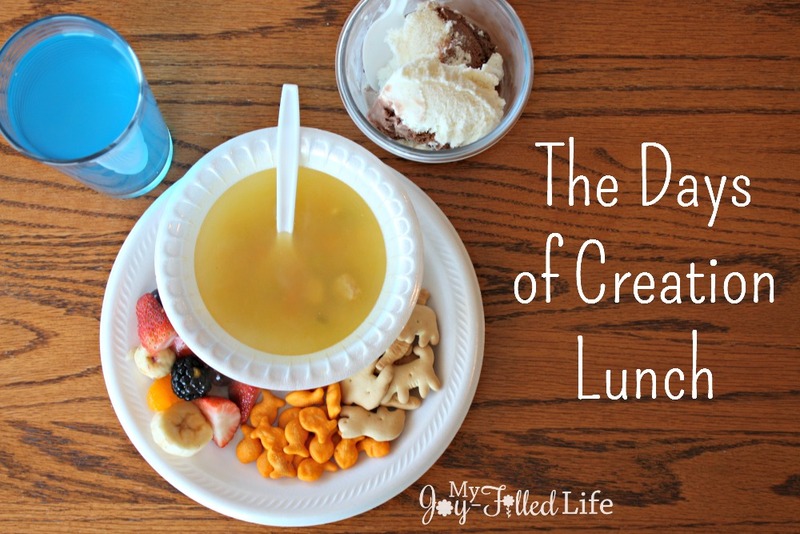 So, I prepared my kids The Days of Creation Lunch. 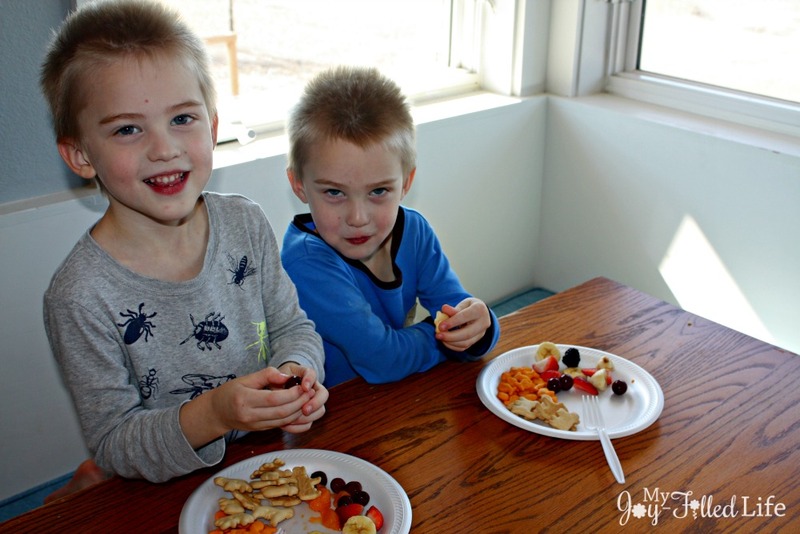 As they feasted on their unique spread, I read aloud the second chapter of The Jesus Storybook Bible and I followed that up with reading Genesis 1 – 2:4 in our Bible. 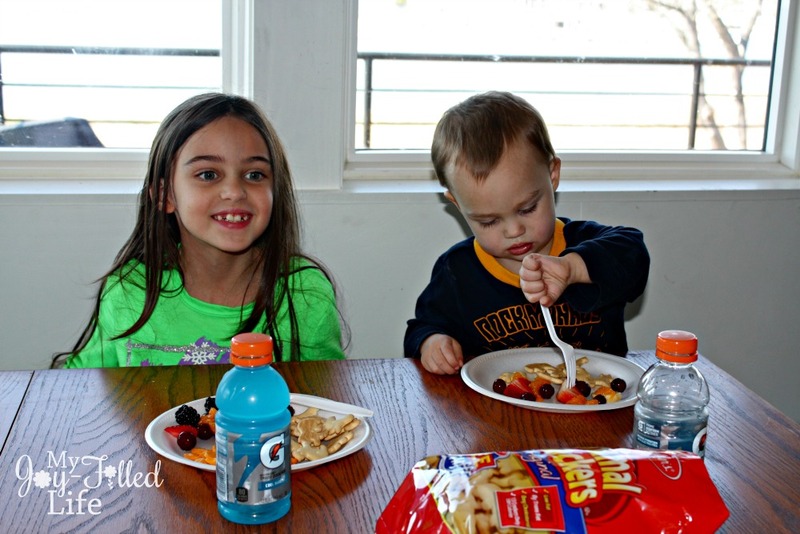 As they ate each of the ‘days,’ we discussed it and then I quizzed them when lunch was over. For day one, we ate chocolate and vanilla ice cream. No, we did not eat our dessert first, we did eat this last. 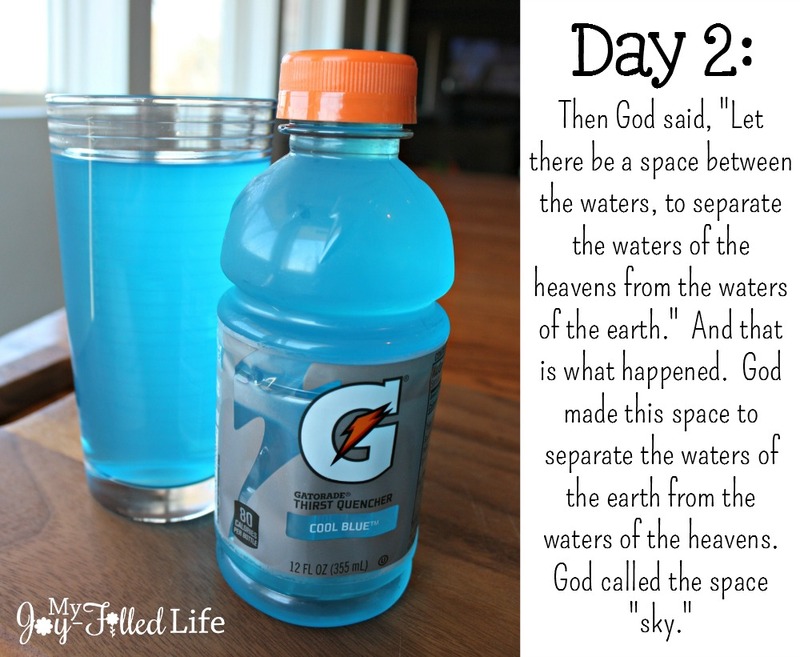 For day two, we drank blue Gatorade. The Gatorade represented the waters that were separated. 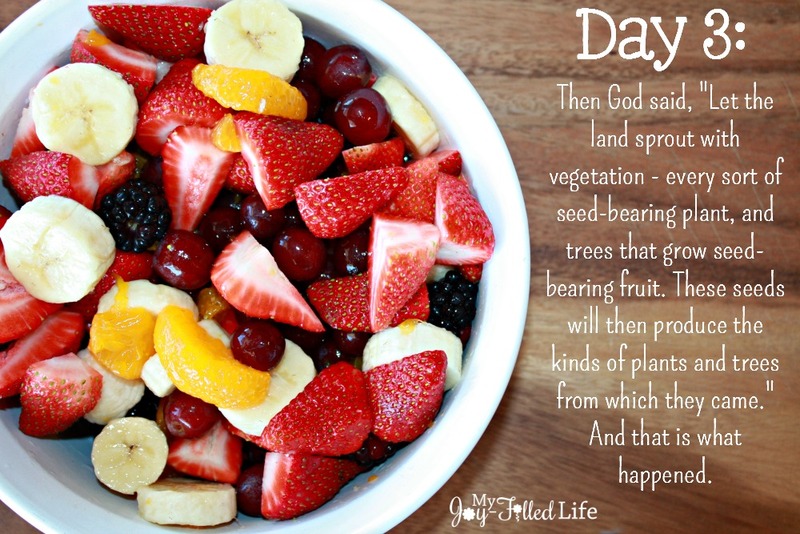 For day three, we had a fruit salad. The fruit represented seed-bearing fruit. 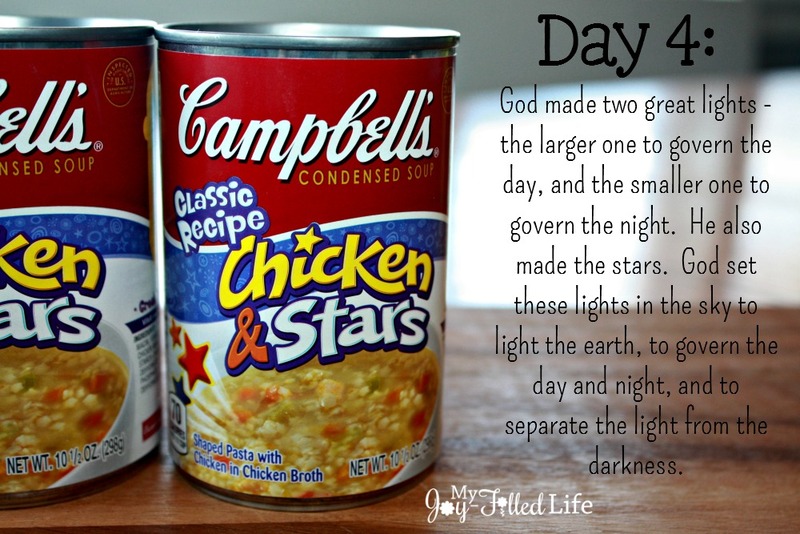 For day four, we had chicken & stars soup. The stars represented the stars that God made on that day. 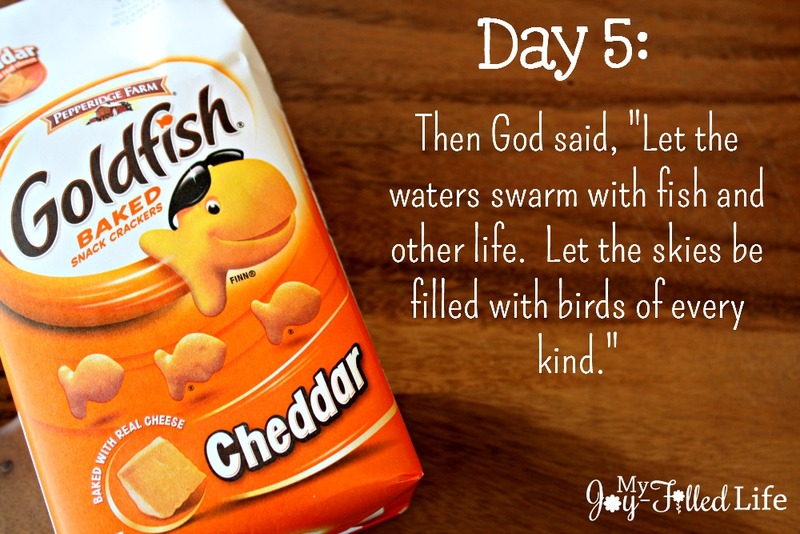 For day five, we ate fishies (these were really good in the soup). The fishies represented all the sea life that God made. 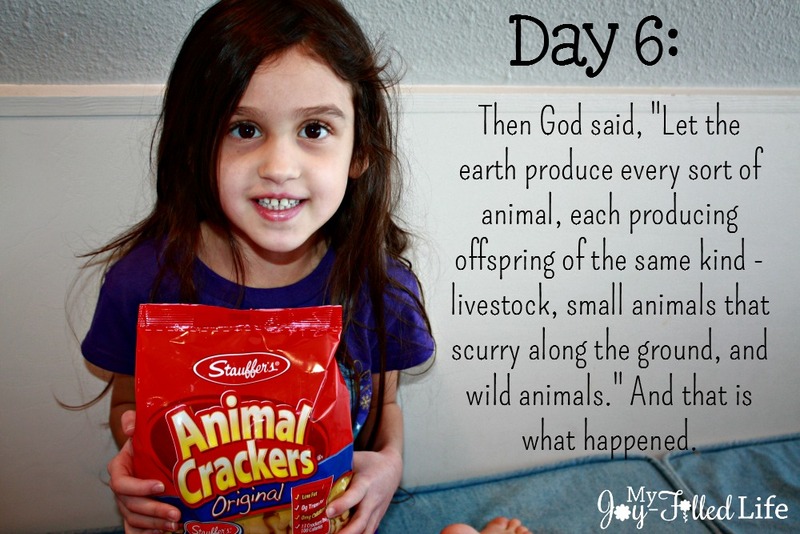 For day six, we ate animal crackers. The animal crackers represented all the land animals. Other food ideas: you could get really creative with these ideas, or these ones. For day seven, we didn’t eat anything. But you know what we did do after lunch? You guessed it, we had rest time!! To represent the seventh day, we all rested by sprawling out on the couch and watching some DVDs. 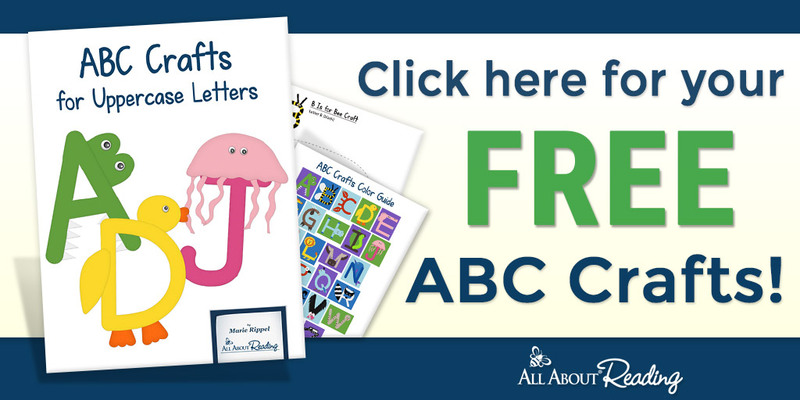 And don’t forget to check back and read ALL the interactive activities for The Jesus Storybook Bible! Click the image below for the full list. Loved your ideas here! 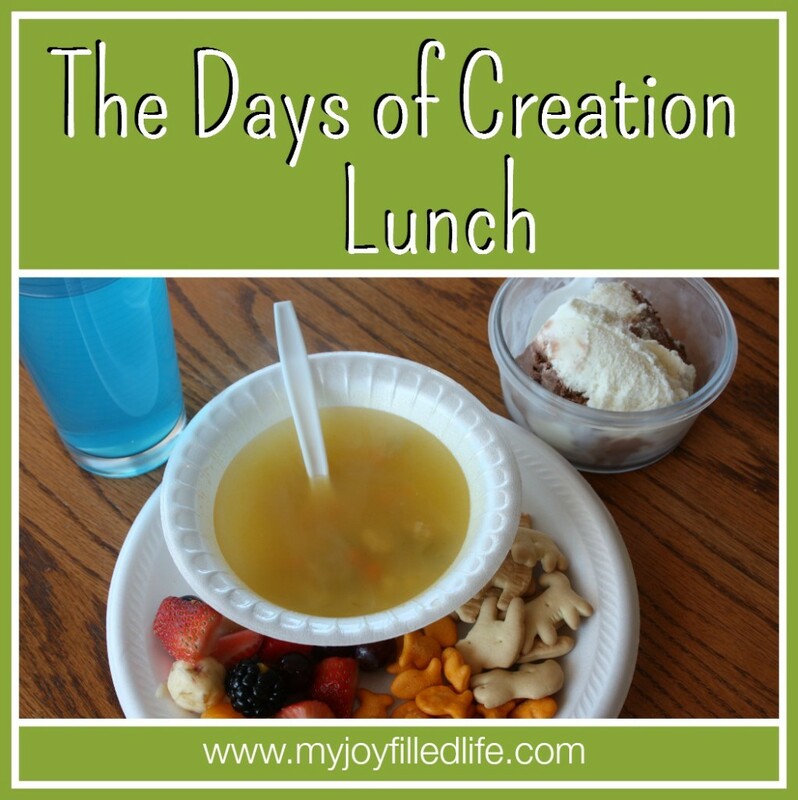 I don’t think I’ve ever thought about eating and drinking our way through the seven days of Creation… such a creative idea! 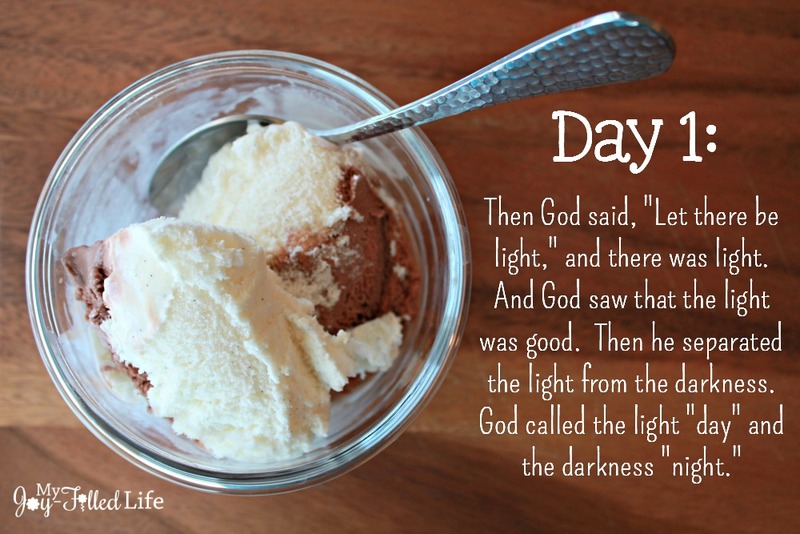 Gotta say that Day One (the separation of light and dark using chocolate and vanilla swirl ice cream) is my favorite!! Yum!! Thank you again for also featuring my LEGO 7 Days of Creation post! Thanks for your creative post! It’s awesome! Can’t wait to go through the list at the end! This is great! We will definitely have to give this a try sometime. I just love this! Sharing it with my readers today! This is wonderful…….. I know my grandchildren will learn as well as enjoy. I will then carry the idea to the preschool and grade school children at church for Children’s Worship. Thanks!!! I look forward to more great teaching ideas.